I’ve been home now for about 2 weeks and getting pretty cozzied up in my hometown of NJ. Weather’s warming up (yay) and the pizza is better than ever. 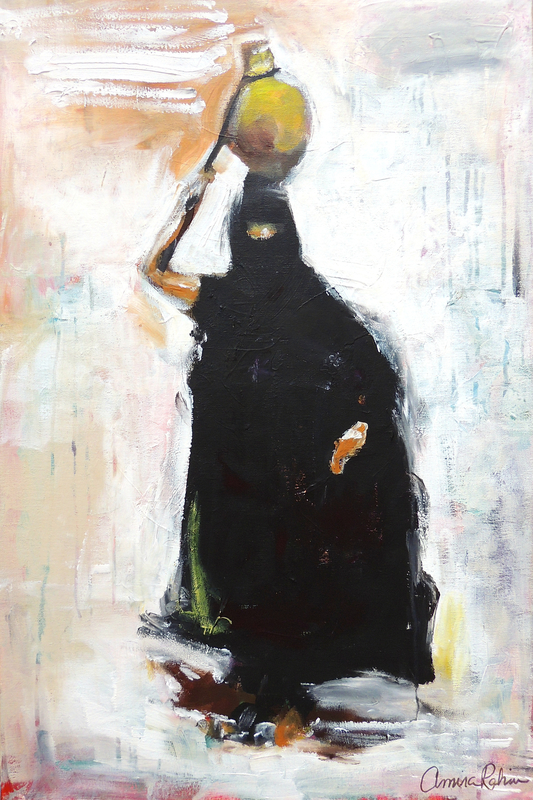 I recently shared my latest collection of veiled figurative women via my newsletter. They are ghostly, secretive, anonymous, mysterious, feminine, serene, and beautiful all at once. That’s all. It’s important to remember to see the positives in anything. I love being able to interact directly with the people who love and collect my art. Nothing beats that in my opinion. So, I was happy to list them on my website as soon as possible. Several people already expressed interest in these new pieces and were happy when I was finally able to offer them for sale. More on that later. Life’s good. Don’t stress too much. People are infinitely kind. Hey you! It’s been a sandy weekend. Abu Dhabi has seen one of the most intense sandstorms ever and left much of us indoors for the past few days. We almost cancelled our safari booking, but decided to just bear the brunt of the storm and hope for the best. Fortunately, I was able take advantage of one of my last few days in Abu Dhabi before vacation and enjoy a traditional desert safari. In a few more weeks it will be too hot to bear! The camels, dunes, and blanket of stars at night made for an unforgettable experience. Here are some of the photos from yesterday. The timing couldn’t have been better. 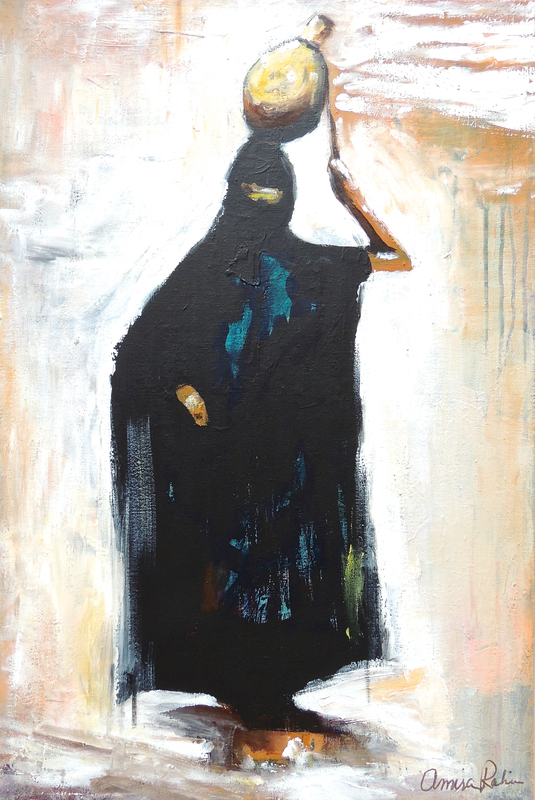 I am diving deeper and deeper into my collection of figurative abstract women and I managed to complete a set of Bedu women on canvas. I am happy to say they have already gone to a swift and trusty collector of mine (thank you, if you’re reading!). I will be doing more with this motif in the future. I love the monochrome scheme for this theme, and I think it lends to the nostalgic quality of these figures that move me so much. I may also explore them in red. If you have any feedback or more ideas, feel free to share in the comments below! It’s that time of the year again: Autumn. Back to school. The days are getting shorter. The temperature cools. The leaves change. And our hearts change too. It’s always been my favorite time of year, literally the mark of new beginnings. One thing I’ve been aspiring to implement into my creative practice is meditation. It’s not anything new. And even in our Islamic tradition, there is much on the topic of reflection, contemplation, and sitting in solitude–absolute stillness, and reconnect with The One. And yet, we seldom do it. Sure, praying five times a day is a spiritual discipline, but without a pure and undistracted heart, it can quickly turn into a chore. I have to admit, I didn’t start meditating out of any religious encouragement. I see a lot of literature circulating on social media around meditation, but it’s mostly for the physical and mental benefits, which I can surely use. There are so many benefits to meditating, and this post is certainly not the expanse to explain them all. So, I just thought I’d share a little of my thoughts on how it’s going for me. Today, I decided to meditate for only the second time. I am using the Headspace app which I highly recommend because it guides you every step of the way without it feeling too “goo-goo gaga”. I’m not into that (or maybe, I am, but don’t realize it yet). I concentrate on my breathing. This is really important. I have recurring back pain and at my last chiropractor visit, I was instructed on how to breathe properly. Turns out, I’m not even breathing right! Meditation makes you more conscious of your breath, even if it’s just for a few minutes. I feel the colors that resonate with me the strongest when my eyes are closed. You know how it goes. You’re in bed, trying to fall asleep, and then BAM! Hoards of painting possibilities seem to fly through your mind endlessly. I am been trying a mental practice of staying in bed, sleeping yes, but before sleeping, take a mental screenshot if you will of the paintings in my head. In the morning, I can usually remember what I loved the most. Meditation helps me know for sure exactly where I want to go. Today, I asked myself, my soul, my spirit, whatever you want to call it: “What do you need today? What do you want to feel? What do you want to love like, eat like, be like, today?” It’s a strange concept at first, but really comforting. Just saying to myself, I’m going to fulfill you. You are fulfilled. You are fulfilled. You get this cool, hippie vibe of general chilled-outness that I love. I’ve always been a worry-wart, self-prophesed perfectionist. That was cool and all in college. But I’ve made leaps and bounds in my self-awareness since then. It feels great to be honest with myself, to relax, to say “You got this,” “you’re good.” I don’t have to prove anything to anyone. Taking 10 minutes to meditate each day is like giving life, society, people, the small voices in my head, whatever, a fat hand to the face. A pause. A complete stop, as I take a moment to…well, enjoy this moment. How do you use mediation in your creative practice or in general?